The church took hundreds of years to build, and wooden support beams put inside in the 1200s are still there today. Unlike the stone towers at the front of the building, those wooden frames inside make the church flame-friendly. Notre-Dame Cathedral, an intricately-carved gothic church that has been sitting in the heart of central Paris for more than 850 years, is on fire. The blaze erupted late Monday afternoon, as stunned tourists and locals stood on the streets of Île de la Cité, an island in the middle of the Seine where the church is located. Many people opened their phones and filmed the bright orange flames billowing into the sky. Construction crews had been working on a $6.8 million renovation of the church’s spire. That spire, pictured below, fell to the flames less than an hour after the blaze broke out. A church spokesman told French media that the medieval frame, which is like the church’s skeleton, was also alight. That is not good news for the church. The hulking framework of wooden beams that supports Notre-Dame is composed of huge pieces of timber tinder, ripe for catching light. The supports are even called a “forêt” (or forest), because they’re enormous pieces of oak. 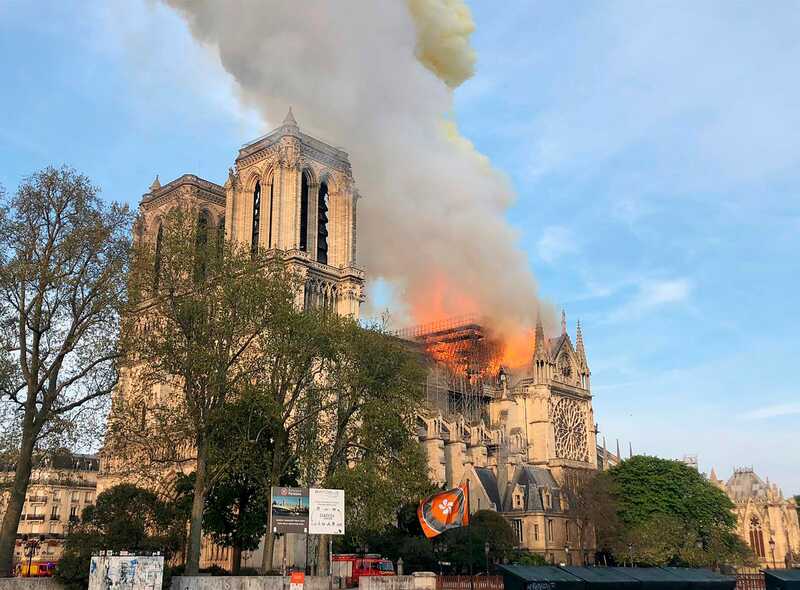 According to Notre-Dame de Paris, the church framing is more than 100 meters long and the beams that are burning have been standing there since the 13th century.